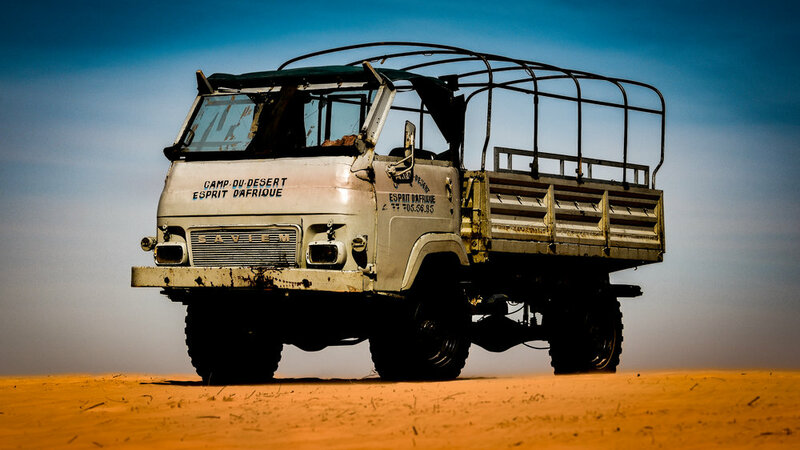 This is a 6-channel recording of a 1969 Diesel Saviem TP3 4x4 truck driving off-road on sand dunes in the desert of Lompoul, Senegal. The library is recorded at 24 Bit/48 kHz with 2 DPA 4060 mics in the cabin, 2 DPA 4061 mics in the engine compartment, 1 DPA 4061 on the air intake and a Sennheiser MKH 8040 on the exhaust. The car sounds nice and gritty, throaty at times, and very rattly in the cabin. It's certainly something you don't come by every day. The Saviem TP3 is the 4x4 version of the Renault Super Goelette SG2, powered by a 3.3 liter MAN Diesel engine. The model has been used as tactical and ambulance truck by the French Army and somehow ended up in Senegal where it now works as shuttle between Lompoul village and Lompoul Desert Camp. It looks like it can drive virtually anywhere thanks to its very good ground clearance, immense tires and powerful engine. The recordings cover the engine starting, some idling, constant driving on sand dunes, uphill, downhill, going through all gears, revving and then the engine stopping. The 6 different perspectives cover the engine, exhaust, air intake and clunky, clattering interior and offer flexibility when designing vehicle sounds.